The All on 4 dental implants technique is a practical and simplified solution for people who have lost or are about to lose all or most of their teeth. With a full arch rehabilitation, you can get natural looking teeth in a single sitting at the dentist’s office. This is why the technique is also referred to as teeth in a day in Houston. The non-removable dental implants are fixed permanently and not only look but also function like strong natural teeth. So you can always flash a beautiful smile and also enjoy the food items that you had to give up due to missing teeth problems. As a reliable and safe treatment for edentulous patients at any age, the all on four dental implant technique has a very high rate of success and long lasting, delightful results. There was a time when people with lost teeth had no other choice than to replace them with a denture. But those temporary dentures could only replace the look of teeth not the function. Cleaning them was another cumbersome problem and it was not possible to maintain a good level of hygiene. Also, users faced difficulty in speaking clearly and had that constant fear of dentures coming off while laughing or smiling. With a dental implants treatment there is now a solution which involves the use of strong titanium implants to create new, functional, permanent teeth. As a metal, titanium has the ability to fuse well with the jaw bone and creates a strong base on which porcelain caps or crowns (that resemble shiny, white teeth) can be fixed. The conventional dental implants technique involves the use of 5 or more implants to fix new teeth. This is a time consuming procedure as the patient needs to wait for a few months and allow the implant site to heal before the caps can be placed. But with all on 4 dental implants, your dentist uses only 4 implants to fix a full arch of teeth. 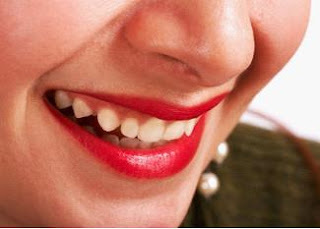 Conventionally, teeth implants need to be fixed onto the jaw at an inclination of 90 degrees from it. When your dentist uses the all on four technique, the 2 implants used for the front are fixed in the same way (at angle of 90 degrees) but the ones fixed at the back side of the jaw are inclined at an angle of 45 degrees. When the bridge is fixed to the 4 implants, the angular placing of implants secures all of them together and this makes for better fusing with the jawbone. All on four teeth implants also heal faster and have a very low risk of getting dislodged. If you have loose teeth and want to replace them with a strong set of dental implants, the damaged (or loose) teeth can be removed in a comfortable surgical setting under dental sedation. The implants are placed after this and become a long lasting aesthetic and functional solution for your teeth troubles. The All on four technique does make smile makeovers possible while also giving you a set of healthy, functional teeth.